That’s right! More FREE ice cream today! 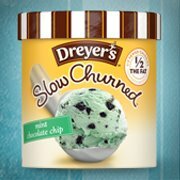 Get a free cup of Dreyers Slow Churned ice cream. It says they are gone for today, but I don’t think they have started giving them out yet today. I think that is from yesterday. They will post when they are available. Please note their is a limited number of coupons daily, so if you miss today try tomorrow. Offer is void in CA, CO, LA, NV, and TN. What’s your favorite kind of ice cream? We’re pretty partial to Shatto Milk Ice Cream Sammiches!